When Valerie came to New York City, she ultimately discovered her love of real estate working at a boutique firm handling everything from marketing and bookkeeping to staging apartments. In love with New York’s architecture and having a passion for helping and meeting people, Valerie got her NYS real estate license in 2014. Since then, Valerie has worked on over 80 co-op, condo and townhouse transactions totaling over $50M in closed deals. 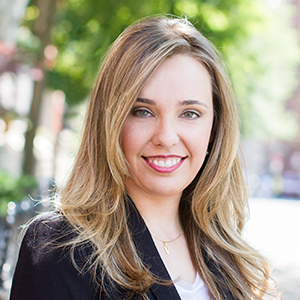 As a member of the Christine Toes Muldoon + Team, she works on all property types in the Manhattan and Brooklyn markets. Valerie's diverse responsibilities encompass showings, marketing, board package preparation, client services and much more. Her strong interpersonal and organizational skills are complemented by her keen eye for detail and design. Valerie's interior design background enables her to envision the potential of a property, optimize its presentational appeal and in turn, maximize profit for her sellers. Originally from Bethesda Maryland, Valerie received a BA in English from Indiana University with a minor in Painting. Thanks to her French mother, she spent most summers in France, and is fluent in the language. Extremely creative and visual, Valerie established and ran her own interior design firm after college. She later had the opportunity to work in film post production, interacting with top celebrities; plus she used her entrepreneurial and marketing savvy to help grow her uncle's photography studio business outside of Chicago. A New York City resident since 2005, Valerie previously lived in Park Slope, Brooklyn and currently resides in Marble Hill in the Bronx with her husband, son and adorable Pit Bull dog, Mazzy. The best views in the Berkshires! This special 13,000-square-foot, 61-acre estate was built on a unique ridge with eastern and western views of more than 50 miles in either direction. The six-bedroom, six-bathroom home features an elevator, four fireplaces, surround sound in every room, an outdoor wood-burning stove, two windowed, walk-in closets, a breakfast room, a family room with a pool table, and a dining room that can easily accommodate parties of up to 24. You can watch the sunrise and sunset from the master bedroom. The barn—a perfect guest house—currently doubles as an art studio on the ground floor; an open loft on the second floor; and a stately home office on the third floor. It comprises an additional two bedrooms, 2 1/2 baths, a full kitchen, and two wood-burning stoves. Every detail of this property has been carefully considered, from an elevator for moving firewood to space-saving murphy beds. The grounds are beautifully landscaped, boasting a serene garden, outdoor pool, and a pool house with enviable views and plantings. The pool house is fully equipped with a half-bath, outdoor shower, and kitchen. Additionally, the home is solidly reinforced with copper and enviroshakes roofing, HardiPlank siding, radiant heating on the ground floors, a back-up generator, and heated parking for six cars. Catamount Ski Area is a mere five minutes away, and the nearby towns of Great Barrington, Stockbridge, and Lenox in MA and Hillsdale and Hudson in NY State feature great restaurants, shopping, arts, and cultural attractions. Why spend three times the money—and more time driving from New York or Boston—on property in the Hamptons when you could call the "Round Top" estate home?